A slow growing oval tree. 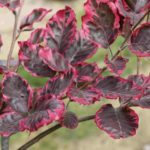 The purple leaves have margins irregularly colored with splashes of pink and cream which are brighter in spring. It prefers some shade, and rich, moist well-drained soils. The fall color is bronze to copper. 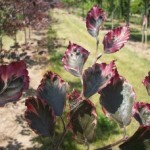 Use as an accent or specimen in the landscape.